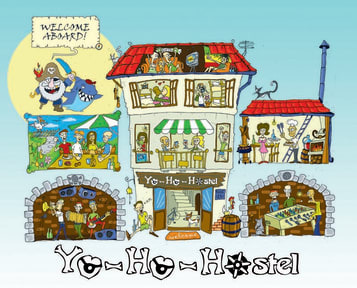 Yo-Ho-Hostel - 12th Years we offer you the BEST PRICE in Varna ! Come, check and stay longer than you expect! Top rated hostel in Varna since 2007 from www.hostelworld.com! Sleep Easy ! Best recommended hostel in Varna from 'Lonely Planet' Guide Book 2008, 2009 ,2011 and 2015 ! The only hostel in Varna recommended from 'Le Guide du Routard' from 2008 till 2016 ! If you don't like boring places! We will always give you an option to do something fun and interesting. This is the ONLY hostel where every night you can enjoy live music and meet some of the best musicians, artists and sports people from Bulgaria - exchanging interesting experiences with them. On arrival we require 10 BGN ( 5 EU ) key deposit. We will recommend you the best places to eat in Varna -Traditional Bulgarian, Turkish, Greek, Armenian, Italian, Spanish, Japanese and Fish restaurants. We are working with the best bars and clubs- you will be welcome like a V.I.P. there ! We are in perfect relation with our friends hostels in Bulgaria! This is Yo-Ho-Hostel - culture and alternative, obligatory place for every backpacker who wants to explore Varna, Bulgaria! Très bon accueil chaleureux dans ce pays sympa qu' est la Bulgarie! Très bien situé! 10 minutes de marche de la plage, 2 minutes de l'artère commerciale principale. Très confortable, j'ai dû retarder mon arrivée, le personnel a été très accueillant et compréhensif. Je recommande chaleureusement! not best hostel of my life, nice staff but the bed was old and not very good. The breakfast was very good, but there is just on bath for 8 peoples :/ ...., I think you can find better place on that city . Chambres standards, personnel aimable et disponible pour vous fournir le plus d’informations possibles sur la ville. Petit déjeuner un peu léger, et douches/sanitaires sont confondues, ce qui est un peu moyen. Pas de possibilités de garer un véhicule à proximité. Auberge correcte dans l’ensemble. This is the shittiest place I’ve ever been to. The hostel staff is soooooo rude. I saw them screaming on many guest several times for no reason. The shower/WC were really nasty. I didn’t like my stay. I reccomand you to stay as far as possible from this hostel. Worst place ever.